Glad you asked. It’s a role-playing game, like a video game with no boundaries. One player takes the part of Game Master (or GM for short). The GM creates an exciting adventure story - - maybe a quest to regain a kingdom, a struggle to outwit a criminal mastermind, or a battle to repel an alien invasion. Through this world, the GM will guide the other players, who have assumed the personas of fictional characters - - perhaps a nimble elven thief, a sturdy dwarven fighter, suave superspy, or a mighty superhero. RPGs are a great pastime for exercising your creativity, stretching the imagination, and just plain having fun with your friends. They have been around for decades and come in all shapes, sizes, and price ranges. So how does FAST separate itself from the pack of fine gaming systems currently on the market? FAST was designed by three guys with over 100 years of combined RPG experience on both sides of the GM screen. They’ve seen systems come and system go. They’ve lived through what works and what doesn’t. FAST is not necessarily an innovative masterpiece, but it *has* been created using the best ideas refined in the crucible of at-the-table role-playing. The goals for FAST are listed below. If a rule or mechanic didn’t work toward these concepts, it was altered or thrown out. Easy Character Construction - - FAST allows you to build the kind of character you want, quickly and easily. Just buy four common Attributes, choose from a variety of broad-brush Skills, add a few straightforward Powers (if appropriate), and you’re done. Simple, Rules-Lite Game Mechanics - - FAST emphasizes role-playing, not intricate tables, complex formulas, or flipping through pages of rules. FAST uses the same easy-to-learn game mechanics (FAST dice) for every resolution. Quick Combat - - Blasting alien invaders and defeating supervillains are an expected part of RPGs. As the name implies, FAST is designed to resolve combat fast - - each player makes one attack roll and one defense roll per round. There are enough options to allow versatility without bogging down the game while the referee consults a rulebook. 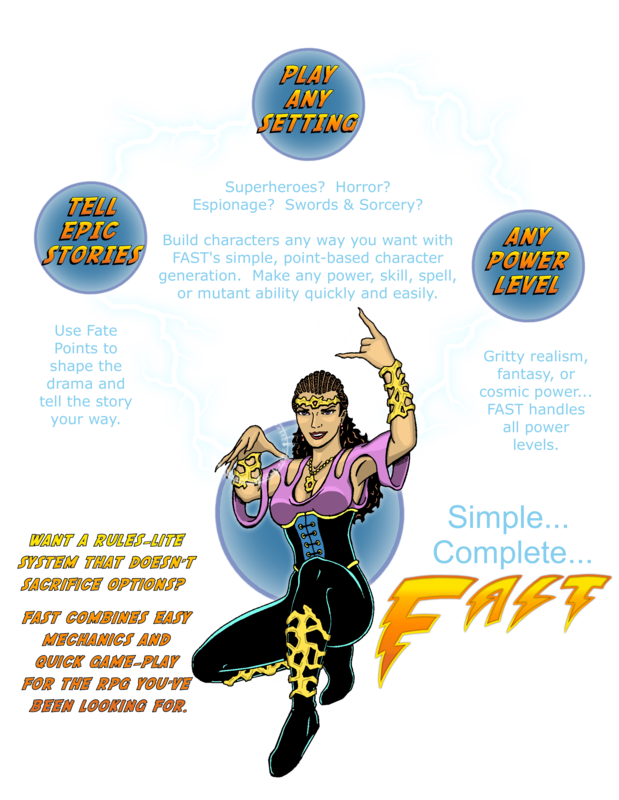 Cover All Genres - - FAST is a universal RPG. This one game system handles every conceivable genre: medieval fantasy, gritty cyberpunk, Victorian-era gothic horror, star-faring sci-fi, high-flying martial arts, and comic book superheroes, just to name a few. FAST has been around since 1998 and we’ve yet to find a campaign that didn’t thrive under it. Cover all Power Levels - - This was a big hurdle: juggling the numbers for Attributes, the costs of Powers, and the range of Skills to make every level of play seamless. It would defeat the purpose of the game to require one set of rules for street-level realism, a separate set for heroic fantasy, and still another for world-shattering superheroes. FAST achieves that delicate balance to allow the same rules to work at any power level.